“Have kindness from the heart and faith. Always pray when you start the day. Woven into this indigenous wisdom are fibers of devotion, honoring, purification, flow, humor, centeredness, belief and trust in self and the universe and so much gratitude. Uqualla, who is from the Havasupai tribe who live within the western Grand Canyon; and three traditional Hopi friends who live on high, windswept mesas of remote northeastern Arizona. “Ancient spiritual wisdom has survived in global wisdom people. We are instruments of healing and healed in the process. Healing is for every breathing moment. 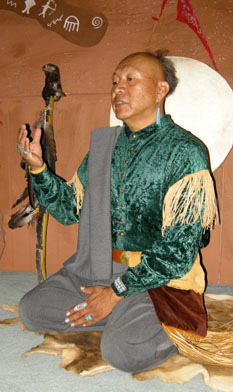 Medicine people, shamans, healers have many names. There are many spirits such as rock spirits, tree spirits. Humans each are given giftings to facilitate a particular medicine. All are unique. Healing is as diverse as the many grains of sand, of stars, colors. Medicine is a vibration within all of Creation. Not just human. We are just a small part of the total, receptors and givers of healing. Plants are physical form manifesting into this reality. Plant, ceremony, tradition has guaranteed complete healing with the addition of spirit-soul vibrations into it. It is instilling that frequency and vibration into the place of receptiveness. I watch so many people prepare medicine and exclude the sacredness of it. So the body won’t completely heal. You can simply heal by touching. Touch the essence within: mind, heart. If that door is not open, the person will not heal. Ancient medicine was not to allow a person to exist without knowing there was reason for them to exist. They are ill because they have not honored their vessel with spirit as watcher, the guide. We have the gift of choice: you will fall, you will hurt. This ignites illness. So when a person goes in for healing, the healer knows, they must heal the impurity in the total being. In order to open that door to heal the physical, must honor all aspects. Honor and be happy with this form. Fuel is food thought, wisdom. Contemporary medicine is a result of individuals who have tuned themselves into limited understanding. They do bring corrections. They have a gifting from spirit to understand molecular chemistry, but they do not understand this genius was gifted by great Creator. In that honoring, healing comes forth in various stages. Healing spiritually must begin with each individual within his or her own area bringing healing from within. You will sense the physical medicine that can bring healing for the moment. This is always temporary. Every rising sun be aware of Creator that allows us to be in the best of health. As plentiful as grains of sand and stars of skies–healing is that many and that varied. Understood by science, the right dosage is required to work properly. With spirit, vibrational medicine must be right amount for some awakening. In the time we are here we can emanate, radiate. There is so much to be said for healing. It can be interpreted in so many ways. The best gift is that you have allowed for someone to walk their walk in a beautiful way. I honor all medicine people, native, non-native, scientists, educators–all are gifted but should give thanks daily in their heart. Healing will continue in a right path as long as we are honoring and humble, things come automatically. It harmonizes with our capabilities. People stimulate a part of you that will allow for healing to continue, to touch heart places. You are the only form that needs to be present for healing to happen. Don’t harbor things inside, constantly allow for release. In collective consciousness we find much nurturing, sanctuary. If you seek security, it is a sign that you need to address self. Ceremony is to joyfully make sign to spirit that we truly honor you and should be woven through the whole of your existence. Ceremony reminds us to emphasize our connection to the unseen. It stimulates spiritual vibration to an ascended level. Everyone in that circle has a part to add and will come out stronger spiritually. Enjoy the simplicity of waking every morning to understand your journey, life purpose. Be able to see the sunrise, this assures you are breathing. Unseen has many names: something greater, essence. This has allowed the opportunity of journey this day. If you make it to setting sun, reflect, give rest. If negativity is there, address it in different light. It will in time resolve. Heart take lead pulls self away from physical ego. Trust what is there and felt; it takes lead into your life. Start from where you feel within. “Just as you plant a seed and take care of it from the day it is planted, you, as a being, transform as you work with the universe. Nature is the grounding for whole universe. We are plants for the whole universe. To heal the universe, be strong with that stem. Give yourself that opportunity to heal. The heart of healing is to accept it to come to you. Pray together, become one–it helps you open. Don’t hesitate. Practice society within your heart. Open to your own individuality. Group energy helps, but you have to accept. Have courage to give your prayers. The terrorist attack was a wake up call to the universe. “Take bad energy out and give it to the Creator, release your inner self. Then you regain power. Prayers, use lots of prayers. I use different types of herbs for different problems on body points. I look inside the body using a crystal like an x-ray and see things that should not be there. “We’re here to protect and preserve this land for our children and their children. Where you are born, you always go back, that is your umbilical; it is always imprinted. We send our messages from the center of Mother Earth to infinity. Our natural foods grown from the land sustain us.” He spoke of how since time immemorial Hopis have maintained their sovereign status given to them by the highest leader who is always there for everyone. He was encouraging each of us, of all cultures, to express our true heart. This is our gift to the world that changes everything around us.